We are grateful to the people at Toyota and DriveShop for allowing us to test out this 2017 Toyota RAV4 Platinum for a week. All opinions are 100% ours! I have never been a snob when it comes to the vehicle that I drive. In fact, I sometimes wish I lived in a larger city where a lot of people don’t even need cars to get around. But living in a mid-sized city in the Midwest, driving is just a standard way of life. I just want something to reliably get me from point A to point B. It doesn’t have to be anything fancy and it certainly doesn’t have to be anything expensive. So I have lived my adult life driving affordable automobiles from domestic manufacturers. They have been alright. But when you buy a cheaper, older car, you often loose that reliability that I am always chasing. I love to be able to turn the key of my car on a cold day and KNOW it will start, not HOPE it will start. When I think of very reliable automobiles, honestly, the brand name that comes to mind is Toyota. I have never personally owned a Toyota, but I have had several friends that have. I had two high school friends that both had used Toyotas from the age of 16, through college and well into post college life. My one friend, Ryan, drove his Toyota Corolla seemingly forever. So, I was very excited when I heard that I would be able to drive around a brand new 2017 Toyota RAV4. I have always flirted with the idea of buying a Toyota with the intention of driving it well over 300,000 miles and I figured this would be a good way to decide if this would be a good choice for me. 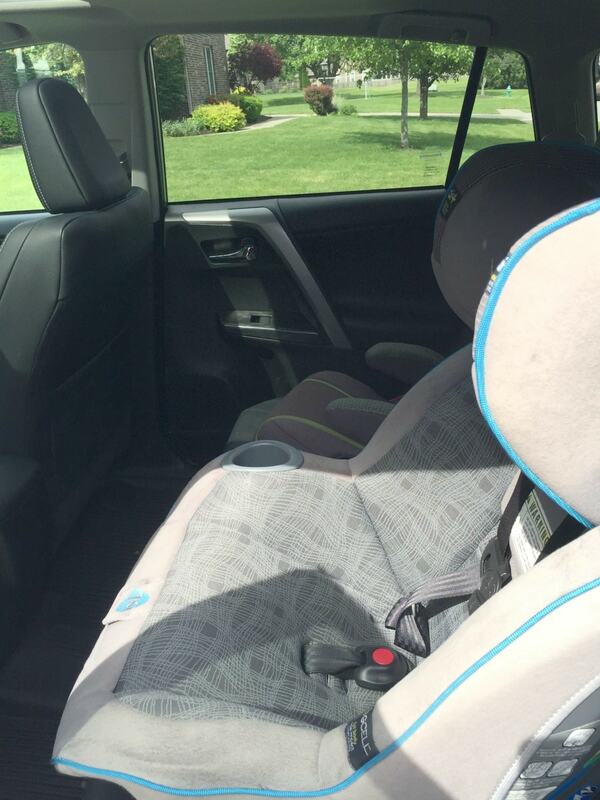 The 2017 Toyota RAV4 Back Seat was spacious enough for our large car seat and my son’s booster. The 2017 Toyota RAV4 comes in 4 different trim levels, the LE, XLE, SE, Limited and Platinum. Toyota gave us the Platinum model to use for the week (thanks Toyota!!!). With the 2017 upgrades, many safety features become standard on all trim options. This is not the case for a lot of cars I have reviewed. I have come across many models that make you buy the upgraded trim in order to have some nifty and very beneficial safety features. So this is really great that Toyota is giving you these no matter which trim you get. 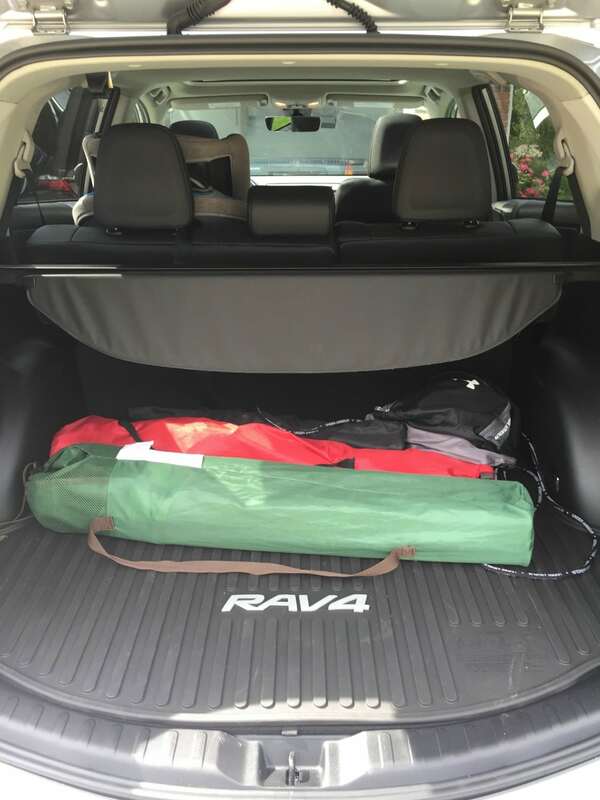 2017 Toyota RAV4 trunk space was ideal for our family. Loading our gear for soccer was a breeze! The other thing I found surprising was that every trim option has the same 205 liter four-cylinder engine that provides 176 horsepower. There are no upgrade options to the engine at all. I know that some people really like to have a V6 under the hood and are willing the pay extra to do that. I am not sure how these people would feel about not having that option. All trim levels are available in either front wheel or all-wheel drive. 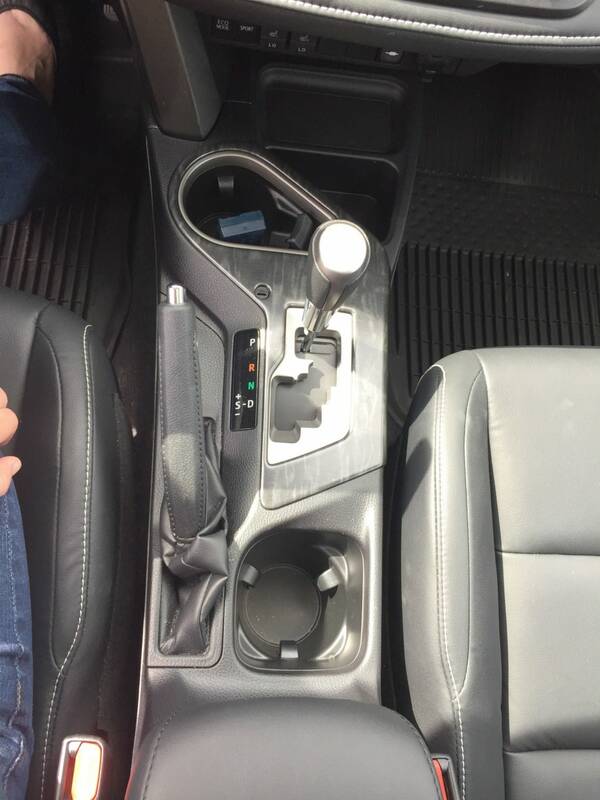 2017 Toyota RAV4 middle console has lots of room for beverages, garage door openers and phones. As mentioned above, all trims come with Toyota Safety Sense P. This integrated safety system includes Lane Departure Alert with Steering Assist, Dynamic Radar Cruise Control (my favorite! ), Pre-Collision System with Pedestrian Detection and Automatic High Beams. So the mechanical guts and the safety features of the all these trim levels of the 2017 Toyota RAV4 are the same. What are the differences? Well, to put it simply, it just comes down to how much cool stuff you want to pay extra for. 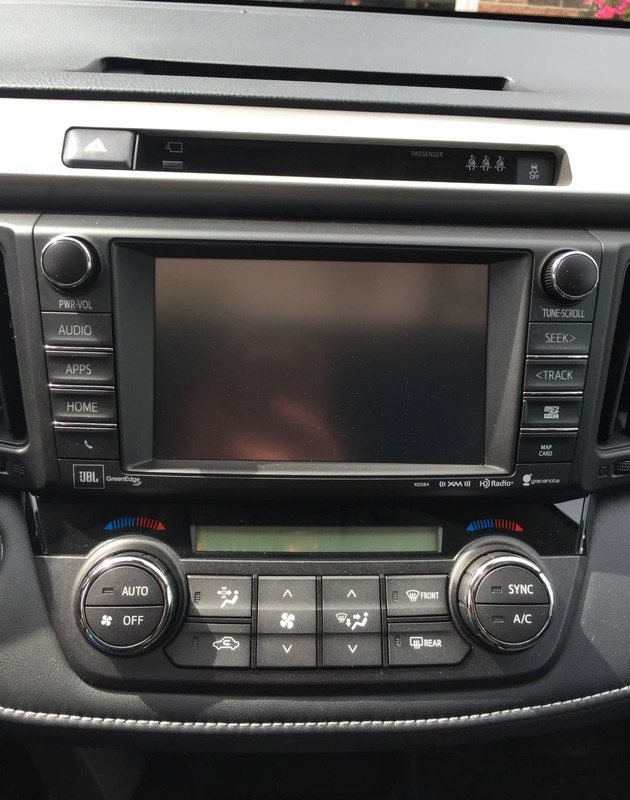 The 2017 Toyota RAV4 entertainment system is user friendly and easy to navigate. For instance, we had the top of the line Platinum Trim. This came with its 5-door Smart Key System. You can simply touch the door handle of the back gate of the RAV4 and be able to open it. It makes things even easier for those of us that always have our hands full with it’s hands-free, foot-activated power lift gate. All you need is to have your key fob on you and you can wave your foot under the rear bumper of the vehicle and the rear gate will open for you. I can’t tell you how useful this was for me when grocery shopping. I am also in a band and am always hauling my music equipment everywhere. So… I love this!!! The Platinum level also has a special trim and full-body paint options that will make it stand out from the rest of the fleet. 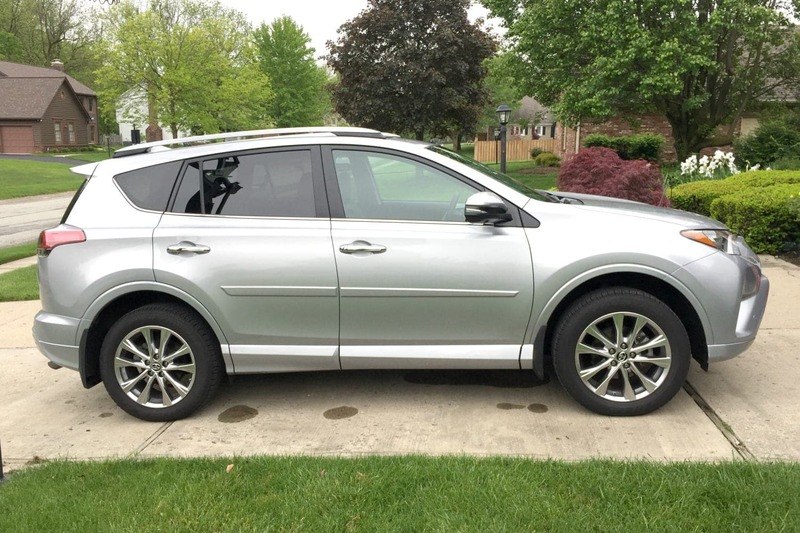 This is a very sharp looking crossover SUV! 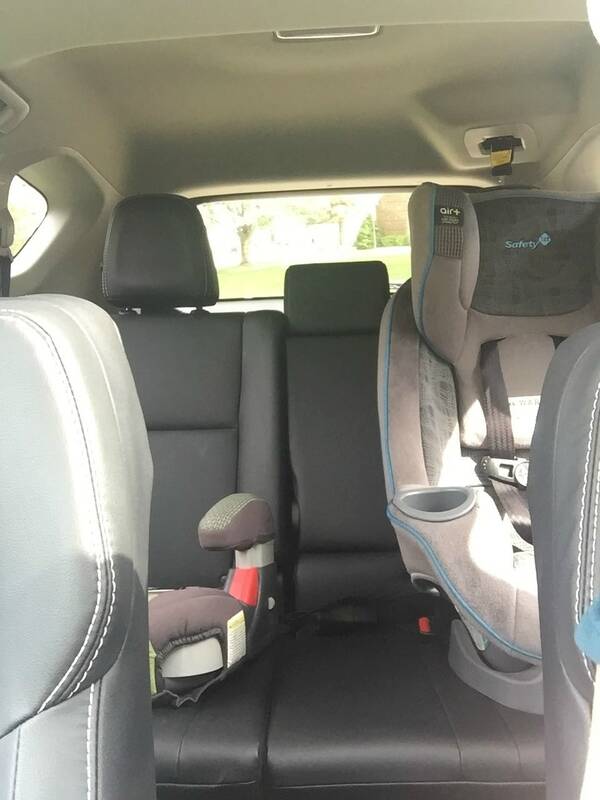 2017-Toyota RAV4 back seat has enough room for the kids but mine liked to put their feet up on the seat so I would invest in covers or guards if you want to keep the leather looking nice. With all the options for trim levels, you can just dive into Toyota.com and start to build your own. Take your time to figure out what features are important to you and your family. One of the features that I know we couldn’t live without is the Dual Zone Climate Control. This way, my wife can be comfortable in the passenger seat while I have my own comfort in the driver’s seat. This is not a standard feature on the LE model, so it may be something we would be willing to pay extra for. Other than that, you just need to decide if you want the powered sun roof? The heated steering wheel? The Bird’s Eye View Camera? The 18-inch Alloy Wheels? There are seemingly endless options that you can choose from. 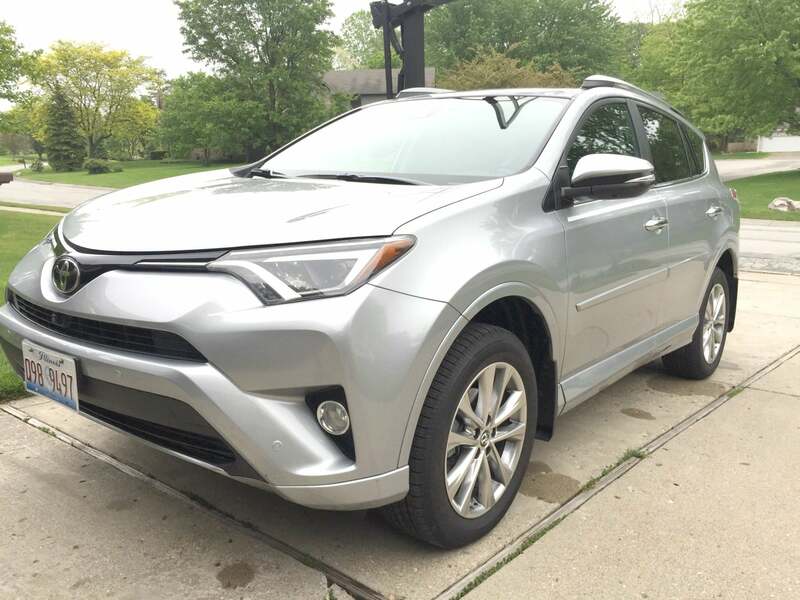 Toyota.com does a great job explaining all of these to you in more depth than I have and they make it easy for you to build your own RAV4 that works for you and your family. So dive right in and explore the endless opportunities and adventures that Toyota is able to provide for you. I still don’t consider myself a car snob, but after driving the RAV4, I think I am becoming one. To learn more about the 2017 Toyota RAV4, starting at $24,410, visit Toyota’s website. For another Family Friendly vehicle review be sure to check out what we thought about the 2017 Toyota Highlander.